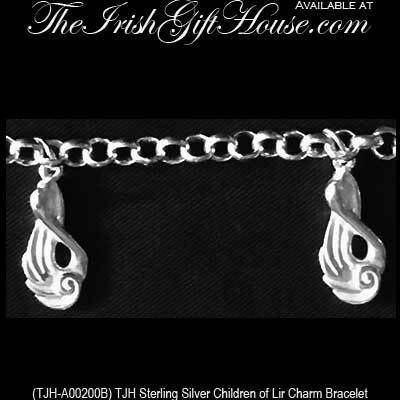 The charms on this sterling silver bracelet are inspired by the Children of Lir Irish legend. This engraved sterling silver bracelet features a swan charm for each of King Lir's four children from the Children of Lir Irish legend. The women's Children of Lir bracelet measures 7 1/2" long and has a lobster claw catch; the sterling silver Children of Lir charms measure 5/16" wide x 3/4" long. 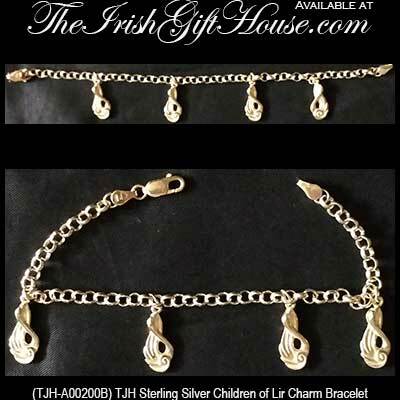 This heavy link Children of Lir bracelet is made by TJH in Dublin, Ireland and is gift boxed, complements of The Irish Gift House. The Children of Lir charm bracelet is inspired by the famous Irish legend. Through a spell, the four children of King Lir, were transformed into white swans that possessed beautiful singing voices.